Your blood has one of the most important and complex jobs in your body. It flows continuously through your veins and arteries delivering nutrients and oxygen while overcoming bumps and lumps, twists and turns, all this with a fluctuating blood pressure. Sometimes, this whole commotion can lead to the formation of blood clots. Clotting can be healthy and normal – helping with wound healing – but it can also be dangerous when the blood clot forms in places where it’s not needed. 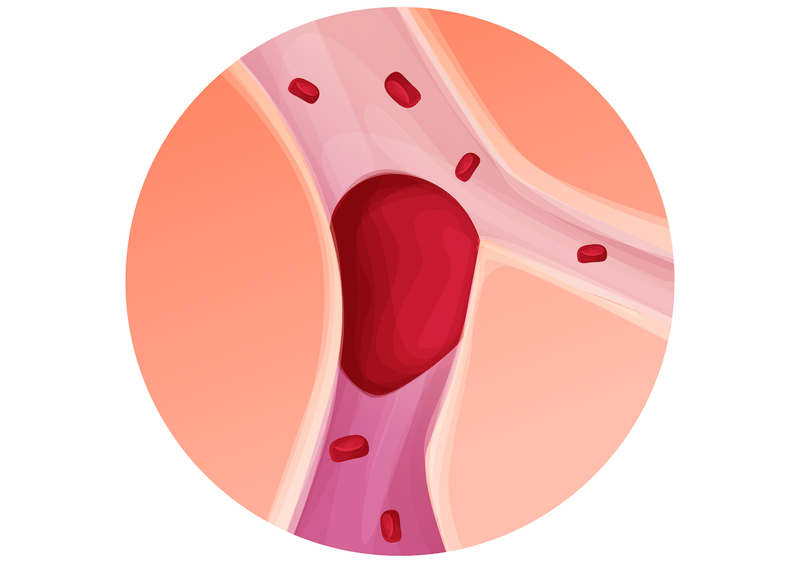 A blood clot is a cluster of blood that has changed from a liquid into a gel-like form. Clotting is an important process that can help prevent you from losing too much blood if you’ve cut or injured yourself, for example. Other times, it can be dangerous. Blood clots happen during a process called clotting. It begins when flowing blood encounters certain substances in your skin or blood vessel walls. When the blood touches the substances, the skin or blood vessel wall break, causing blood to clot. Blood clots can also form when your blood doesn’t flow properly. This causes it to collect in clumps in your blood vessels or heart, forming clots. Waxy cholesterol plaques that form in your arteries can also lead to clotting, usually when a blood vessel is scarred or inflamed. If the plaque breaks open, the clotting process begins. Sometimes, when clots form in your veins, they may not be able to dissolve. This can be very dangerous and even life-threating. If clots don’t move around, they are generally not harmful. But if they move around in your veins to your heart or lungs, it can get stuck and prevent blood flow. This is how heart attacks and strokes happen. In the leg or arm: This is the most common place for clots to form. Symptoms may include swelling, pain, tenderness, red discolouration and a warm sensation. In the heart: Blood clots in the heart cause a heart attack. This can bring on pain or a heavy feeling on your chest. You may also feel lightheaded and have shortness of breath. In the abdomen: Abdominal pain, swelling and food poisoning may be symptoms of a clot in your abdomen. In the brain: A blood clot in your brain is known as a stroke. Symptoms include a sudden, severe headache and difficulty speaking or seeing. In your lungs: Symptoms of a blood clot in your lungs may include chest pain, heart palpitations, shortness of breath and coughing up blood. Stay active and exercise at least three to four times a week. Avoid sitting for long periods. Aim to get up for 5 minutes at least once every hour. Fidget and point and flex your toes while sitting for long stretches to help your blood circulate. Eat a healthy diet, that keeps your blood vessels healthy: a diet rich in vegetables, antioxidants and omega-3 oils. Drink lots of water and wear loose clothing when you travel. Blood clots are usually treated with medication, called blood thinners. Blood thinner medication may be injected under your skin. Your doctor can show you how to give yourself injections or a loved one can help you do it. Oral blood thinner medication is also available. Depending on your condition, your doctor may prescribe either or both the oral and injection blood thinners. Compression stockings may also be used to help prevent blood clots.